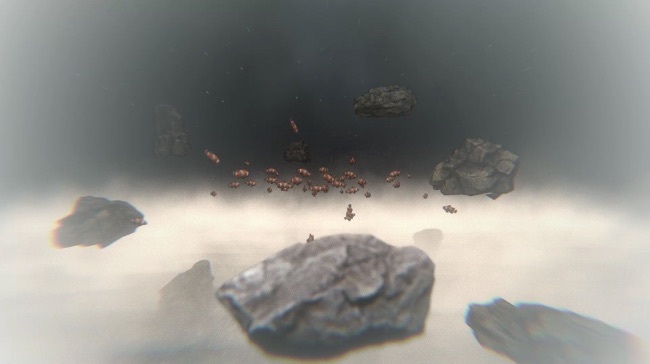 Stone Dream Simulator is an odd little interactive experience that takes place over twelve days during the lifetime of a large rock, intermixed with weird dreams you have at night. In Stone Dream Simulator you can’t move (because you’re a rock), but you can look around to observe your surroundings. The game allows you to experience twelve days selected from throughout the hundreds (or thousands) of years the stone has been on Earth. As time passes the world around you changes, the sea lowers and raises and the rock slowly erodes from a giant boulder to a small pebble. The whole thing is accompanied by a catchy instrumental rock soundtrack and at night your rock has trippy dreams about the things it’s seen during the day. It’s a very odd experience and there’s not much in the way of player interaction but it’s quite interesting living out the life and dreams of a Stone. The dream sequences are very weird and it’s oddly comforting watching the circle of life from the point of view of a rock. A real rock story well worth checking out.